The Azanian Anarchist Alliance (AAA) was a small group at the University of the Witwatersrand (Wits), in Johannesburg, South Africa, formed in 1991. It was probably the first organised anarchist group in the country in decades. One of the founders, HG, co-published the radical zine Social Blunder with his brother NG, in the Indian townshipof Lenasia, south of Soweto and Johannesburg. The group’s politics were a mix of class struggle, radical environmentalism, anti- apartheid and third worldism. The group tried to promote anarchism in various ways. On 8 August 1991, the group called an unsuccessful protest against Unilever, which was recruiting at Wits. That year it also published the pamphlets Anti-Mass, Sam Dolgoff’s Relevance of Anarchism to Modern Society, and Peggy Kornegger’s Anarchism: the Feminist Connection. These were typed up from the few compilations of anarchist texts available locally, and given short introductions in an effort to link them to South African conditions. In 1992, the AAA produced Revolt magazine: there was only one issue, but it was numbered as #2. In 1992, EG and RL established the “Backstreet Abortions” distribution in Johannesburg, and produced the zine Internal Conflict. They were also linked to the 1994 zine No Sensation. “Backstreet Abortions” carried AAA pamphlets, these now including (besides those listed) Revolutionary Organisations (based on a chapter from Class War, Unfinished Business), Alfredo Bonnano’s Anarchism and the National Liberation Struggle (this was billed as a “South African edition,” with a long introduction added), the Anarchist Communist Federation text, The Role of the Revolutionary Organisation and Ten Days that Shook Iraq (a Council Communist-influenced text from the UK). Class War (or the Class war Federation) was a British group, as was the Anarchist Communist Federation: both groups had a huge influence on AAA, which had collected a fair number of their papers, Class War and Organise! EG and RL initiated the Anarchist Revolutionary Movement (ARM) in 1993, a loose group that shared the address of “Backstreet Abortions.” Around this time AAA was wrapped up. 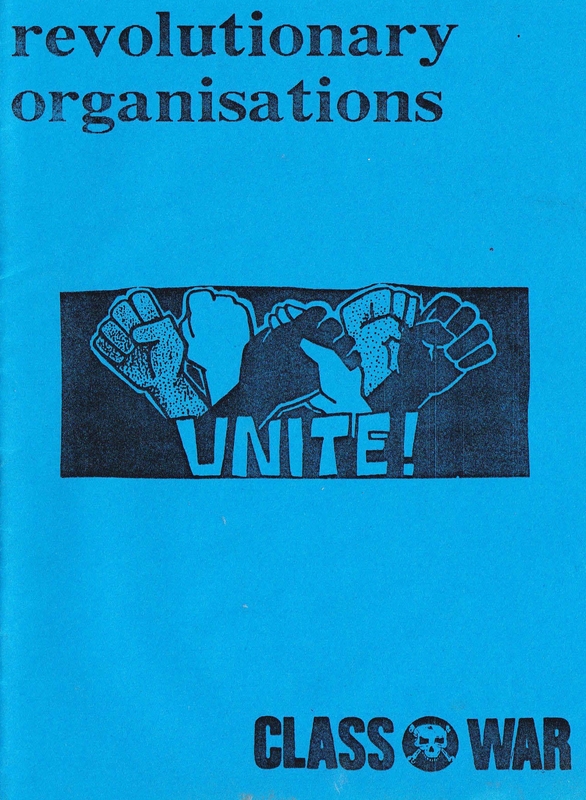 One of the first active anarchist formations in South Africa after 1990 was the small Johannesburg-Lenasia-based group around Revolt and later Unrest magazines (or “zines”), a group that at one stage styled itself the “Azanian Anarchist Alliance.” Both “zines” were one-offs (one issue only was published of each, despite the numbering on the covers …). As with other anarchist groups at the time, the overseas anarchist press was an important influence, mainly UK and USA papers like Black Flag, Class War, Love and Rage, Organise! for class struggle anarchism, and others. Profane Existence, a “political punk” magazine from Minneapolis in the USA, also bears mention. Formed around 1989, the Profane Existence group’s publication provided (in the early 1990s), an important source of anarchist ideas, and had some affinities with the British group Class War (in at least one letter column controversy, the editors even described themselves as part of the Class War Federation). The collective was also linked to a Minneapolis section of “The Anarchist Youth Federation” (AYF, founded in 1988). The AYF published material in Profane Existence, and provided an information packet to people interested in forming similar groups elsewhere; its leaflet was influenced by the style of Class War. The Unrest group had a copy of the AYF packet and was certainly influenced by its contents and ideas, which were a mix of materials from the AYF, other US papers like Reality Now, and other material; notably it included material on the “Black Bloc,” an idea and tactic from the quasi-anarchist Autonomen in Germany, which later became a major feature (from the late 1990s) in Western anarchism. Some of the Unrest group joined the early Anarchist Revolutionary Movement (ARM), as part of ARM’s “class struggle” wing. When that wing was reconstituted as the Workers Solidarity Federation (WSF), Unrest was formally incorporated into the WSF paper, Workers Solidarity. Below is a partial and incomplete scan of the AYF package, as sent to South Africa: click on the image for the PDF. This pamphlet is a reprint of chapter 7 of Unfinished Business: the politics of Class War, a book published in 1992 by Britain’s Class War Federation in conjunction with AK Press. It takes an openly Platformist approach to the question of anarchist organisation, which was a major reason why the pamphlet was produced by people associated with the class struggle wing of the Anarchist Revolutionary Movement (ARM) in Johannesburg. The pamphlet, described as the 1994 South African edition, used as its distribution address/ contact point the (unfortunately named) “Backstreet Abortions” Distribution, also associated with ARM at the time. As with other materials issued at the time, production values were pretty low. The Class War Federation was well known among South African anarchists for its tabloid-style paper Class War, which was locally circulated, as was the the Class War compilation edited by Ian Bone, Alan Pullen and Tim Scargill, entitled Class War: a decade of disorder (Verso, 1991). The Federation deeply impressed the class struggle wing of ARM, as well as its immediate predecessors. For instance a Class War poster, showing a burning police car and captioned “Our Contribution to Global Warming,” was the cover image for the one-off South African anarchist paper Revolt. Class War’s forthright opposition to liberal reformism, lifestylism, and orthodox Marxism, its stress on working class power and struggle, and its clear writing struck a powerful cord; so did its ability to reach large numbers of people. Although it is now clear that not all of Class War members agreed with Unfinished Business, and that the Federation was not very Platformist in practice, the Federation’s impact on what would become the Workers Solidarity Federation (WSF) should not be underestimated. Revolt number 2 (1992), South Africa. The Rio Earth Summit was dominated by the very people responsible for the global ecological crisis in the first place. Solutions were not, cannot, and never will be, found by such groups. Grass roots action is the only answer. In February 1917, there was a Popular uprising in the Russian empire. The Tsar abdicated the principal political parties – most of them Socialist, and began to set up a crude parliamentary democracy, led by the Mensheviks. But Russia was a big, bleak, backward old empire that sprawled across five time zones, communication was bad; the uprisings continued. Radicals were released from prison, dissidents returned from exile, and ordinary people became increasingly aware of the possibilities of communal power. Peasants chased out the landowners, workers took over the factories and many organized themselves democratically through local mass meetings – Soviets.